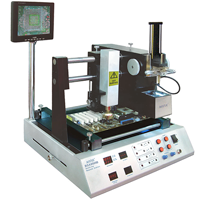 Automatic WISDOMSHOW WDS-750 6800W BGA soldering station - designed for high performance electronics. It is a professional and modern solution for disassembly and assembly of BGA, uBGA, CBGA, CCGA, CSP, QFN, MLF, PGA systems and work with large multilayer PCBs, for consumer electronics, medical, telecommunications, military, automotive and industrial, and prefabrication services . The high power of the station and the efficient cooling system ensure efficient operation and reduce the time of high temperature impact on the board to a minimum. The device was designed for repairing motherboards for personal and industrial computers, graphic cards, notebooks, consoles, mobile phones, modules and car controllers made in lead-acid and lead-free soldering technology. WDS-750 soldering station allows you to control and track all device parameters on a regular basis on a touch screen LCD. 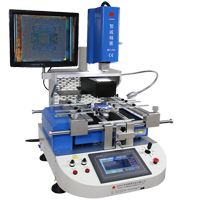 Soldering station BGA WISDOMSHOW WDS-620 5,3kW LCD 7" Split Vision is a professional station for removing and assembly of BGA, SMD, uBGA, CBGA, CCGA, CSP, QFN, MLF, PGA soldered with leaded and lead-free technology. Station is used for servicing motherboards of computers, laptops, consoles, mobile phones, car navigation and modules, and many other devices, so it has a strong position in all electronic services, or GSM. 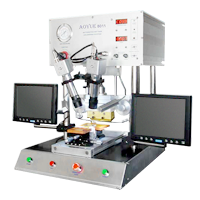 Aoyue BGA 9000A Soldering system is digitally controlled, advanced BGA repair station. 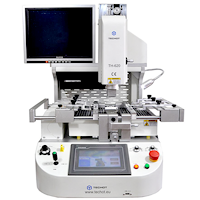 The system of split-vision video helps you to quickly position the solder system. It has optimizer is used for precise adjustment system on the album. The use of heat in the form of IR lamps helped to avoid the problems encountered when working with hot-air stations involving the blowing of surrounding components during soldering. The station is designed for lead-free soldering. Built-in heater accelerates the process of soldering, and avoids the effect of deformation of the plate. 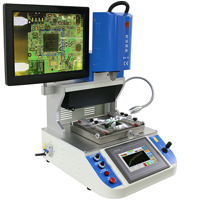 Automatic BGA WISDOMSHOW WDS-720 4200W soldering station with display and video system is an integrated BGA repair system. Professional and modern solution for disassembly and assembly of BGA, uBGA, BGA, CSP, SMD, micro SMD, LGA, CCGA, CBGA, CCGA, QFN, MLF, PGA systems for consumer electronics, medical, telecommunications, military and automotive electronics. The device has been designed with particular attention to small BGA elements, SMD micro-type for repairing main cell phones, all modules and controllers including those made in lead and lead-free soldering technology. A large power as well as an efficient cooling system ensures efficient work and shorten the time of interaction high temperature on the plate to a minimum. 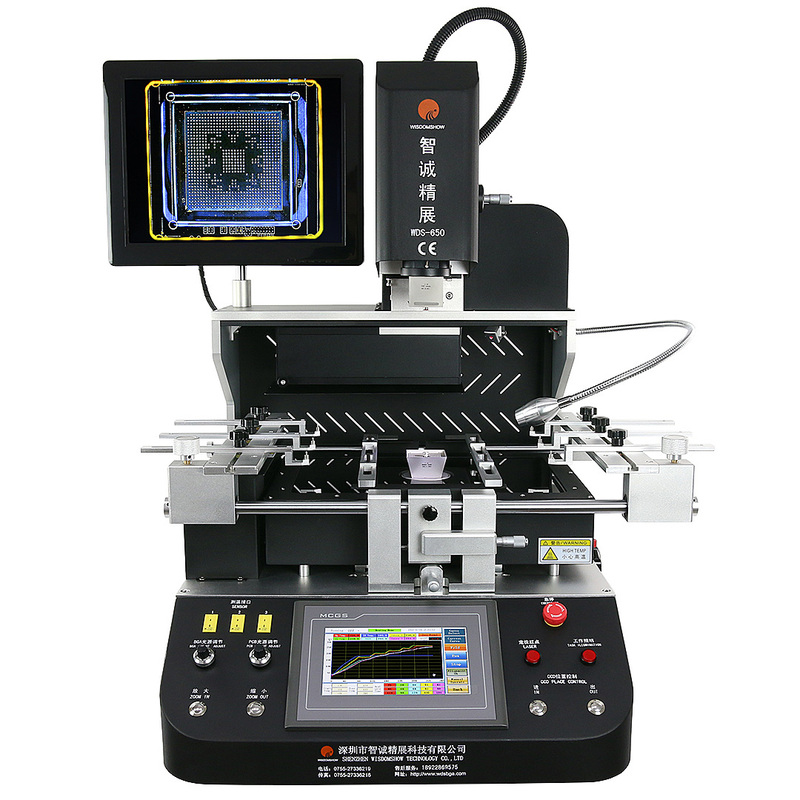 Automatic station BGA WISDOMSHOW WDS-700 Split Vision is an integrated system for repair BGA / microBGA. Professional and modern solution for assembly and disassembly BGA, uBGA, BGA, CSP, SMD, micro SMD, LGA, CCGA, CBGA, CCGA, QFN, MLF, PGA services for consumer electronics, medical, telecommunication, military, automotive. The device is designed with a particular emphasis on small components BGA, SMD micro repair motherboard mobile phones, all modules and drivers including car made in the technology of lead solder and lead-free. The model is particularly recommended for work with small chips and PCB boards and where the manufacturer has not applied the positioning line on the laminate. High power and efficient cooling system provides efficient operation and shorten the impact of high temperature on the plate to a minimum. BGA station Techot TH-W600 - Split Vision has been designed to work in large electronic services, laboratories or departments prototype. With powerful and versatile mounting system boards can be on it to install or remove BGA and SMD measuring up to 80x80mm with small and large plates. But, what sets this model apart from other machines is split vision positioning system allows precise mount components on the board exactly where. Soldering station BGA TOUCHBGA GM5860L 5,45kW CCD LCD 7 with laser pointer is a professional station for removing and assembly of BGA, SMD, uBGA, CBGA, CCGA, CSP, QFN, MLF, PGA soldered with leaded and lead-free technology. Station is used for servicing motherboards of computers, laptops, consoles, mobile phones, car navigation and modules, and many other devices, so it has a strong position in all electronic services, or GSM. 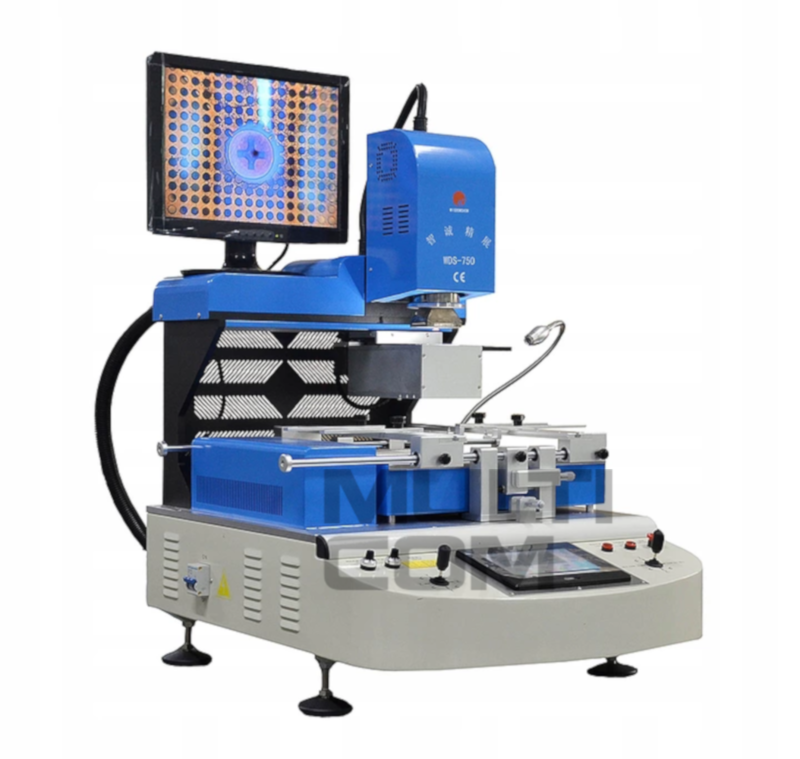 Soldering System Aoyue 8011 HOT BAR is equipped with a three way microadjust system two Powerful magnified camera and LCD screen for precise movementadjustment. Its CPU controlled timer and temperature controls provide precise timingand temperature stability. Finally its automated pneumatic system provides accurateand easy repeatability . 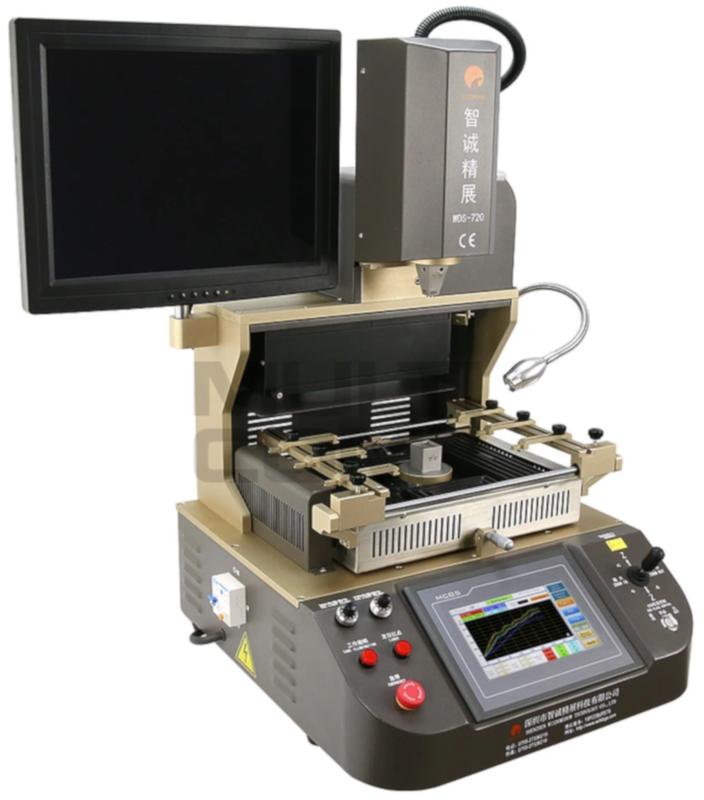 Station Aoyue BGA 9000B is a digitally controlled BGA repair station. 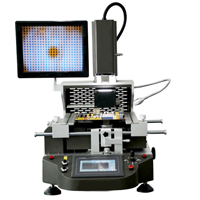 The system of split-vision video helps you to quickly position the solder system. It has optimizer is used for precise adjustment system on the album. In this version, the heat source is a hot-air precision temperature sensor of the air outlet. The station is designed for lead-free soldering. Built-in heater accelerates the process of soldering, and avoids the effect of deformation of the plate. Techot TH-620 Soldering Station is a professional soldering station designed to replace BGA chip on PCB boards requiring high power heating. Suitable for use with both leaded or lead free tin. Thanks to the programmable profiles and high quality heating elements we have precise control over the process of soldering and thus the effectiveness of repair. High power output makes the TH-620 is the perfect tool for electronic services specializing in the repair of laptops and consoles. WDS650 2xHR + 6500W quartz BGA rework station is an integrated system for repairing and replacing BGA, uBGA, CBGA, CCGA, CSP, QFN, MLF, PGA circuits. The WDS-650 model is a very efficient (total power of 6500W), a professional and modern solution for disassembly and assembly of integrated circuits for consumer electronics, medical, telecommunications, military, automotive and industrial services. The device was designed for repairing motherboards for personal and industrial computers, graphic cards, notebooks, consoles, mobile phones, modules and car controllers made in lead-acid and lead-free soldering technology. Especially recommended for working with large multilayer PCBs. The very high power and efficient cooling system ensures efficient operation and reduces the time of high temperature impact on the board to a minimum.